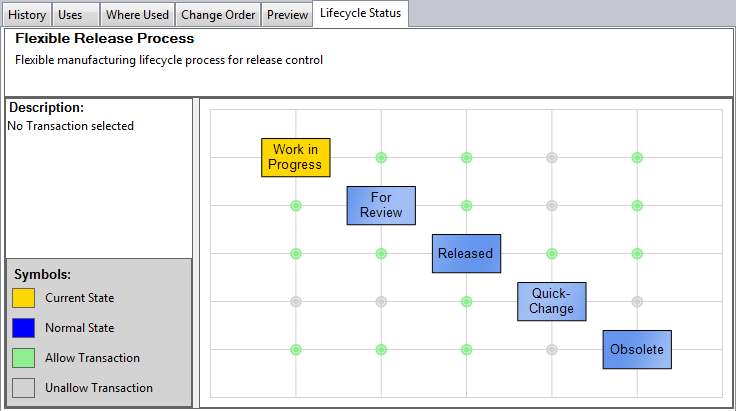 If you are like me, and I know I am, you would prefer to work with a visual representation of file lifecycle states. Thankfully Weipeng Hou, Frank Ran and Yuyue Wang came up with Visual Lifecycle Status. For a selected file, the app shows all the states for the lifecycle, along with the allowed transitions. Select a transition to see more information about it, such as revision bumps or transition rules. A red line is shown if you select a transition that is not allowed. Double click on a state to move the file to that state. Unzip and run the installer. 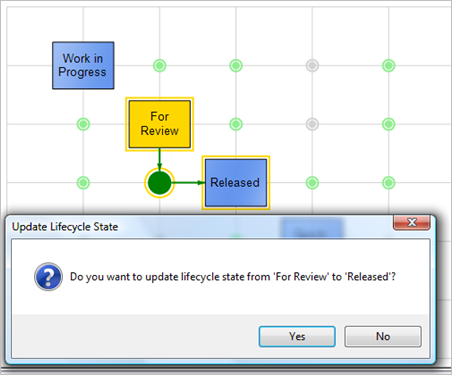 Select a file with lifecycle state information. Come back next week for another exciting Vault 2012 app. Each week I will be posting a new app for Vault 2012. So check back regularly. Now that Vault 11111011100 has been released, I can now talk about the cool new SDK features. There are a bunch of things that I can talk about, but for now, I'll just list the top 1000 features. You can now get Pre and Post events whenever a Vault application performs certain actions, such as checking in a file. There is also a GetRestrictions event which allows you to block the operation. Call directly into Vault Explorer to run tasks like update properties or get the working folder. Inline code samples are now in VB.Net as well as C#. The job server sample app is now also in VB.Net. 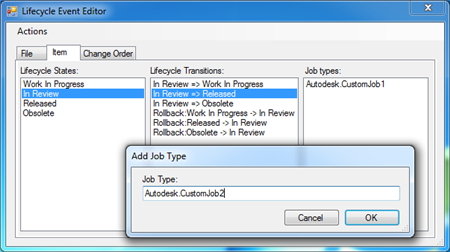 The Lifecycle Event Editor has been expanded beyond just files. You can now run custom commands from files selected in the History, Uses and Where Used tabs. A factory/manager for web service objects has been built right in to the API. If you use the provided WebServiceManager, by default the web services will automatically re-authenticate if you Vault credentials go stale. See the API documentation right as you code in Visual Studio. I'll be going into each of these features and more in the upcoming months. This post was just to give you a taste of things to come (and test your knowledge of binary numbers). To celebrate the release of the Vault 2012, I will be releasing 1 sample app per week for the next 4 weeks. 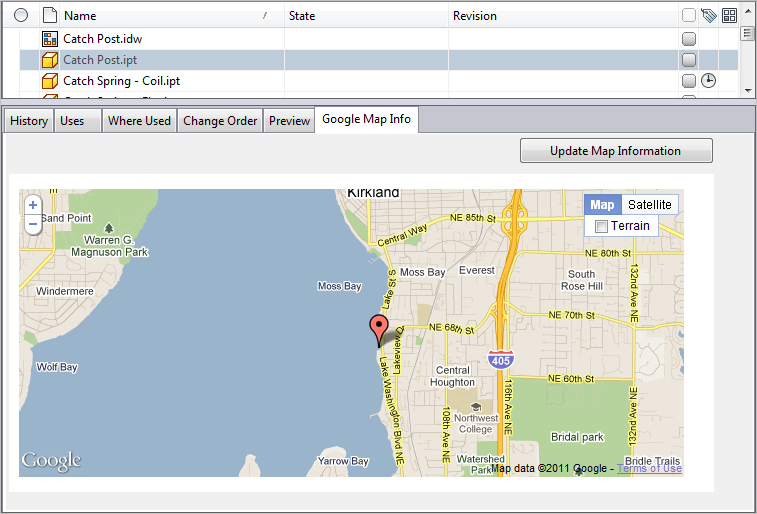 Let's start things off with the Google Map Extension for Autodesk Vault. This one is authored by Gavin Guo, one of the developers on Vault. 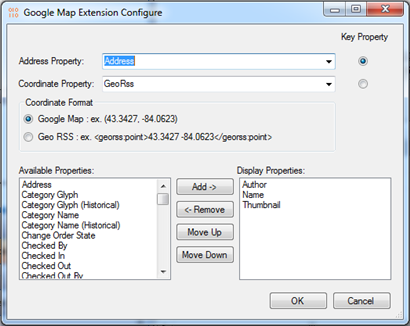 The Google Map Extension for Autodesk Vault allows you to set user defined property (UDP) values containing location information for files and folders in Vault. You can then view and update these files and folders using Google Map technology. View and edit location information for files and folders in Vault. View single objects in the custom tab. View multiple objects using the Show Google Map command. Use either an address or a latitude/longitude point to set the location. Works with the GeoRSS property in AutoCAD drawings. Customize the information displayed on the Google Map marker. Before the extension can be used, a Vault administrator needs to configure some settings. Run Vault Explorer and log in as an Administrator. Under the Tools menu. Select Administration->Vault Settings. Decide which UDP you want to use to store Address information and which UDP you want to store latitude/longitude information. Either create new properties or decide on existing ones. Make sure that the UDPs are associated to at least File and Folder types. Exit out the the Property Definitions window and the Vault Settings window. 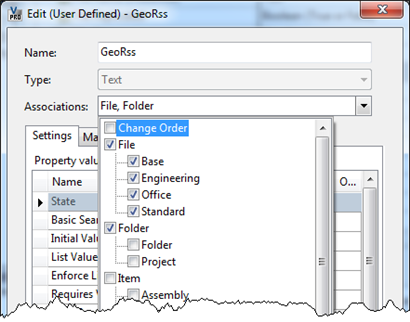 Select the UDPs you want to address and coordinate properties. Select the key property, which is what Google Map will use to set the markers. 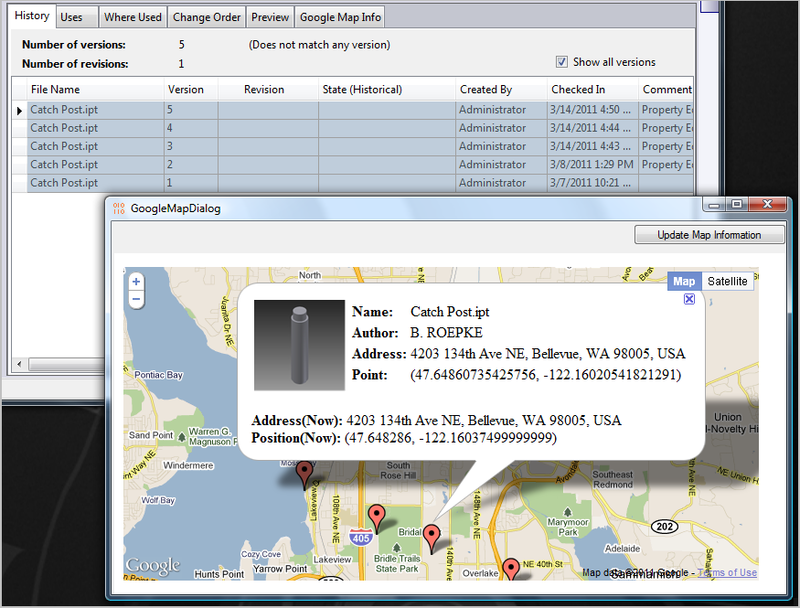 Select the coordinate format and select the properties you want to show up in the map markers (thumbnails are supported). Click OK to save. At this point the extension has been configured. 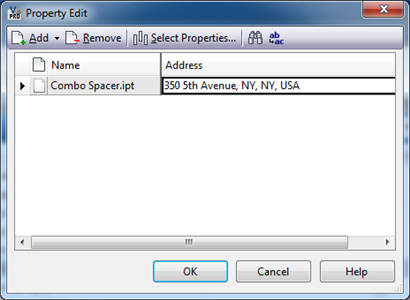 Update either the address or coordinate property, depending on which is the key. Select the update object and select the Google Map tab. You should see a map correlating to the property data. To update, you can drag and drop the map marker to a different location and select Update Map Information. To show multiple objects on a single map, multi-select all the files and folders you want to display on any Vault grid. Next, right-click and select Show Google Map command. 1 app down, 3 apps to go. 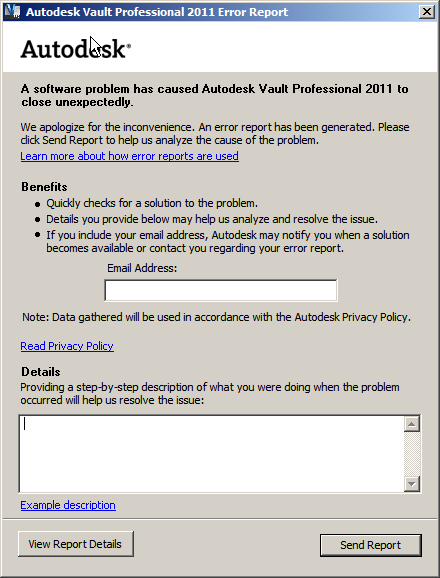 Keep checking back for more apps and Vault 2012 API details. Any many of you have pointed out, there isn't much sample code out there on working with Change Orders. So let me attempt to remedy that by providing code on two common operations you might want to do through the API: creating a new Change Order and updating the lifecycle state of a Change Order. A new Change Order will always use the default workflow. 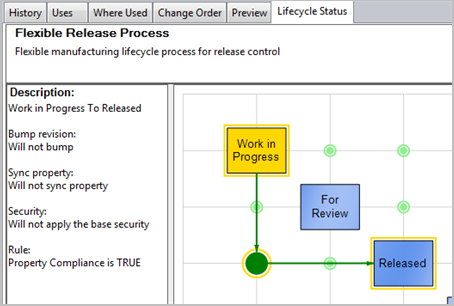 A workflow is the set of lifecycle states and transitions (activities) between them. Once created, the Change Order is locked to that workflow forever. 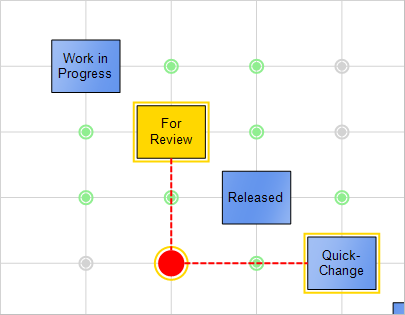 So, when you create a new Change Order you don't need to pass in the workflow. But you do need to pass in the routing, which is the set of users and their roles on that Change Order. You also need to pass in the number for the Change Order. The easiest route is to just use the default routing and default numbering scheme, as shown below. There might not be any activities. There are a couple of "sink" states where Change Orders cannot move out of. An activity might loop back to the same state. For example, you can perform the review operation when you are in the review state. This will result in the Change Order moving to the review state. So even though an activity was performed, the state is the same. Closing a Change Order requires additional information, effectivity. Therefore, a different API function is used for that case. Like with many Item operations, you need to do 2 calls to perform the update. The first call starts the operation and the second call commits the operation. If something goes wrong, you need to call an undo function. If you have a custom command and an exception is thrown within your code, good programming practice is to handle that exception and not let it bubble up to the hosting application. The reason is that the hosting application may not know how to handle the exception properly. Some API's may have built in support for passing specific types of exceptions up the stack, but Vault Explorer does not have one of those APIs. Let me explain what happens when you throw an exception from a custom command within Vault Explorer. If the exception is directly on Vault Explorer's call stack, it will get "eaten" by Vault Explorer. In other words, Vault Explorer will catch the exception then do nothing with it. This is the intended behavior for Vault Explorer. However I have recently become aware of a few cases that result in un-intended behavior. One interesting back door is when the exception comes from an event in custom UI. For example, your command launches a custom dialog, and your OnClick event code has an exception that you don't handle. In this case, the Vault Explorer treats it like an exception from any of the built-in dialogs and attempts to handle the issue. Usually the handling involves parsing the error and displaying a formatted error dialog. In the case of server errors (SOAPExceptions), this is great because Vault Explorer will parse the error for you and display it in the proper language. I'll admit, this is pretty nice back door. The only downside that I can see is that the error text was written with Vault Explorer in mind and may not make sense in the context of your application. But if the exception is not a SOAP Exception you will likely get a CER dialog. If you don't know what a CER dialog is, let me show you a picture. Recognize it now? You want to avoid this dialog. An even worse case comes up if your command spawns a thread which bubbles up an exception. In that case, the CER pops up and the application crashes. You really want to avoid this dialog. The best way to avoid these bad cases is to handle your exceptions. When in doubt, you can always wrap everything in a try/catch block. See examples below. In my last Coding for Performance article, I explained the best way to get File objects from a set of File ID values. But what if you don't have the ID's? What if you want to get all the files in the Vault, and you don't have any information to start with? I came up with 3 techniques you can use to get this information. Let's see wich one performs the best. 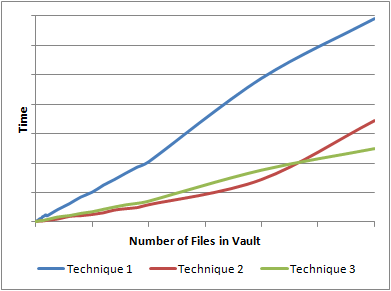 Technique 1: Start at the root folder and recursively scan through each folder one level at a time, gathering up the files along the way. The cost is going to be 2 API calls per folder in the Vault. For each folder, we will be calling GetLatestFilesByFolderId and GetFoldersByParentId with the recurse parameter set to false. Technique 2: Gather up all the folders and get all the files in all the folders with 1 API call. You can get all the folders by calling GetFolderRoot then calling GetFoldersByParentId with the recurse parameter set to true. Next, call GetLatestFilesByFolderIds and pass in all folder IDs. The result will be all files. So we get it all in 3 API calls. Technique 3: Do a file search with no search conditions, which will result in finding all files. FindFilesBySearchConditions is the functions that I will be using. I will be passing in null for the folderIds parameter, which will result in a search across all folders. The number of API calls depends on the paging setup. Divide the total number of files by the paging size and that's how many API calls are made. NOTE: I'm going to assume that there are no file shares for this test. In other words, each file lives in one and only one folder. NOTE: Technically there are 2 variables here, the number of folders and the number of files. To simplify things, I'll assume a constant ratio between files and folders. This is usually the case in the real world. The more files you have, the more folders you will probably have. I will be using a ratio of about 10 files for every 1 folder. So what happened here? It looked like Technique 2 was slightly better than Technique 3, but it curved up at the end. The reason is that Technique 3 tries to get to much information in a single call. First, it gets every folder in the Vault with a single call to GetFoldersByParentId. Next, it gets every file in the Vault with a single call to GetLatestFilesByFolderIds. As I mentioned in my last performance article, you need an upper bound on these calls. You can't just get millions of objects in a single call. Both Technique 1 and Technique 3 have boundaries built-in, which keeps things nice an linear. Technique 3 wins out because it makes less API calls than Technique 1. Another nice thing is that Technique 3 is folder independent. It will have the same performance regardless of the number of folders or the folder structure.